Roberts Gordon Blackheat low intensity unitary radiant tube heaters help provide comfort, while facilitating reduced energy consumption. The sun does not heat the earth’s atmosphere directly; rather its radiant rays heat the earth, people and objects. 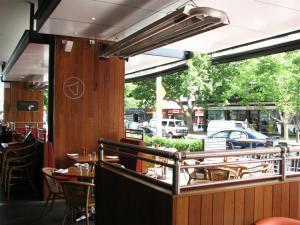 Roberts Gordon Blackheath radiant heaters work in a similar way to heat a building and its occupants. With RG Blackheat radiant heaters, floors and objects become massive secondary heat exchangers. These objects act as reservoirs, storing heat, then releasing it into space by re-radiation and convection to raise space temperature at occupant level. The appliance range covers Straight [Linear] models, Double Linear models with a burner pack at each end and central fan, plus ‘U’ pattern [U Tube ] heaters. All models are available for operation on either Natural or LP gases and are Australian Gas Association Approved [6399 G]. In addition to standard commercial and industrial indoor heating applications, the appliances may also be used for outdoor applications such as cafe and restaurant terraces and domestic outdoor patios provided the units are protected from rain and wind speed in excess of 15 kph. Appliances feature heat treated aluminised steel tubing, stainless steel tube couplings and deeply profiled aluminium reflectors for the highest rate of infrared radiant emission on a standard heater. Please check our radiantheaters microsite focused on these products. Call us today to discuss your heating requirement.